In my last article, I talked a bit about the theoretical aspect of the famous Sequence to Sequence Model. I have shared the code for my implementation of seq2seq – easy_seq2seq. I have adopted most of the code from en-fr translation example provided by Google. Hence, most parts of the code, that dealt with data preprocessing, model evaluation were black boxes to me and to the readers. To make matters worse, the model trained on Cornell Movie Dialog corpus performed poorly. A lot of people complained about this. After training the model for days, most of the responses were gibberish. I apologize for wasting your time. The objective of this article is two-fold; to provide the readers with a pre-trained model that actually works and to describe how to build and train such a model from (almost) scratch. Before doing that, let us recap what we discussed in the previous article. Recurrent Neural Networks or simple RNNs, are a special kind of neural networks that are capable of dealing with sequential data, like videos(sequence of frames) and more commonly, text sequences or basically any sequence of symbols. The beauty of it is, the network doesn’t need to know what the symbols mean. It will infer the meaning of symbols, by looking at the structure of the text and relative positions of symbols. There are some amazing articles on RNNs and what they are capable of. To put it simply, an RNN, unlike an MLP or CNN, has an internal state. Think of this state as memory of the network. As the RNN devours a sequence (sentence), word by word, the essential information about the sentence is maintained in this memory unit (internal state), which is periodically updated in each timestep. The essence of a sentence of 7 words will be captured by an RNN, in 7 timesteps. This is just a “story” about RNN, intended to provide a high level understanding of RNN. To understand the actual mechanism of RNN, read Denny Britz’s series of articles on RNN – 1, 2 ,3, 4 and then move on to Karpathy’s The Unreasonable Effectiveness of RNNs. The naive version of RNN, is typically called a Vanilla RNN, which is pretty pathetic in remembering long sequences. There are more complex versions of RNN, like LSTM (Long Short Term Memory) and GRU (Gated Recurrent Units) RNNs. The only difference between a Vanilla RNN and LSTM/GRU networks, is the architecture of the memory unit. An LSTM cell consists of multiple gates, for remembering useful information, forgetting unnecessary information and carefully exposing information at each time step. Christopher Olah does an amazing job explaining LSTM in this article. Check out Denny’s tutorial on GRU. The Sequence to Sequence model (seq2seq) consists of two RNNs – an encoder and a decoder. The encoder reads the input sequence, word by word and emits a context (a function of final hidden state of encoder), which would ideally capture the essence (semantic summary) of the input sequence. Based on this context, the decoder generates the output sequence, one word at a time while looking at the context and the previous word during each timestep. This is a ridiculous oversimplification, but it gives you an idea of what happens in seq2seq. The context can be provided as the initial state of the decoder RNN or it can be connected to the hidden units at each time step. Now our objective is to jointly maximize the log probability of the output sequence conditioned on the input sequence. Read these papers for a deeper understanding of seq2seq – Learning Phrase Representations using RNN Encoder-Decoder for Statistical Machine Translation, Sequence to Sequence Learning with Neural Networks, Neural Machine Translation by Jointly Learning to Align and Translate, A Neural Conversational Model. As promised, here is a working model of a twitter bot based on seq2seq model. It is trained on twitter chat log borrowed from Marsan-Ma. Before going into how to bootstrap and run the code, let us look at some of the decent responses spit out by the bot. For some reason people were really into tweeting about Trump. Pretty good responses right? I have let the model overfit on the training data, just a little bit. The unk symbols in the conversations, refer to the words that aren’t frequent enough (rare) to be put in the vocabulary. Now, how to reproduce these results in your pc? # now.. open up jupyter notebook and run "03-Twitter-chatbot.ipynb"
Are you happy with the results? Is the pretrained model working well for you? If not, raise an issue in the github repo. Let us move on to more interesting things. What are the steps involved in building such a bot? Any project in Machine Learning follows this pattern. Study and analyse the data, preprocess the data to make it compatible with the model, split it into train, valid, and test sets, create a model, feed the training data, let it overfit, reduce the depth/width of the model and train again(which I usually skip), evaluate the model periodically to look for overfitting/underfitting. I keep all my datasets and preprocessing scripts in this repository – suriyadeepan/datasets. Twitter dataset and scripts can be found here. Follow the instructions in README, to process raw data or to download processed data. I am presenting the gist of it in the snippet below. You might want to read data.py to get a clearer picture of preprocessing. How to choose the vocabulary? It makes sense to have a vocabulary of the most frequent words. But how to choose the size of vocabulary? 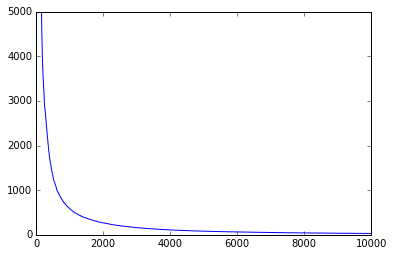 I have plotted the frequency vs words (most frequent to least frequent). I have chosen a vocabulary that covers most the area under the curve. Any word not in the vocabulary will be replaced with the UNK token. The number of UNK tokens in the dataset make a big difference. If there are too many unknown tokens, the model learns to output UNK tokens more than the words in our limited vocabulary. I have reduced the overall percentage of unknown tokens in the dataset to 3%, by increasing the vocabulary size and by removing sentences with too many unknown words (rare words) from the dataset. It is advisable to keep it less than 5%. We have processed the data, changed it from raw lines of text stored in a file, to zero-padded numpy arrays of indices, along with necessary metadata (word2index and index2word dictionaries). Now it is time to write a few helper functions that will gather random examples from the dataset, in batches, to feed to the model for training and evaluation. data_utils.py has a couple of functions for that purpose. To build the graph, we create a bunch of placeholders for feeding input sequences, labels and decoder inputs. The labels correspond to the real output sequence. The decoder inputs start with a special ‘GO’ symbol, which in this case is just 0. For each sequence, we create a list of placeholders of datatype tf.int64 (indices), of known length. Next, we create the LSTM cell, the most essential part of the graph. We define a placeholder for keep_prob, which will be used to control the dropout. Dropout is a simple technique to prevent overfitting. It essentially just drops some of the unit activations in a layer, by making them zero. Then, we define a basic LSTM cell and then, wrap it with a DropoutWrapper. The LSTM cells, we just created are stacked together to form a stacked LSTM, using MultiRNNCell. Now we use a high level function – embedding_rnn_seq2seq provided by tensorflow’s seq2seq module, to create a seq2seq model, which does word embedding internally. A copy of the same model is created for testing, which uses the same parameters but has feed_previous switch enabled. This causes the decoder of the model to use the output of previous timestep as input to the current timestep, while during training, the input to a timestep (in the decoder) is taken from the labels sequence (the real output sequence). We use another high level function sequence_loss, to get the expression for loss. Then, we build a train operation that minimizes the loss. Training is fairly simple. We create a method train, that runs the train op, for a given number of epochs. Evaluation is done periodically on the validation set. The model is saved after evaluation. A dropout of 0.5 is used during training. The dropout is disabled during evaluation. When restore_last_session is called, the last saved checkpoint is restored and returned. The predict function does a forward step and returns the indices of most probable words emitted by the model. Read seq2seq_wrapper.py to get the big picture. Let us train the model using the processed dataset. The load_data function returns the dataset (x,y) and the metadata (index2word, word2index). We split the dataset into train, validation and test sets. We set the parameters of the model, like sequence length, vocabulary size and embedding dimensions. We then, create an instance of the model and train it, by passing data iterators to model.train method. If the training gets interrupted deliberately or otherwise, we can continue training from the last saved checkpoint. This is done by getting the session from model.restore_last_session and then passing the session to model.train method. The code for training is available here. #  run model.train with "sess=sess"
I have also trained the seq2seq model using other datasets, like CMU Pronouncing Dictionary, Cornell Movie Dialog Corpus, and Tamil to English parallel corpus. As I am writing this article, my GTX960 is training the seq2seq model on Open Subtitles dataset. I will probably add the results of it tomorrow. I think I have discussed everything I wanted to discuss. If you are confused about anything we discussed, you are welcome to leave a comment below or raise an isssue in github. I will try my best to respond. I wanted to complete this article before the New Year. It is 11:35 PM here in Puducherry, India.